When choosing a caterer you need to think about a variety of things that could sway your decision, there are many things that could affect the success of the food at your wedding. You need to think about what is going to make you and your guests happy. Make a list based on the following points, do your research and you and your guests will have fond memories in their taste buds too. When looking at caterers it is important to consider any specific dietary needs that your invited guests may have, this can include everything from vegetarianism to an intolerance to dairy. You will need to speak to your shortlisted caterers to make sure that they can cater to these needs. It is always an idea to have a vegetarian option available to guests, even though you may not have a vegetarian at your wedding it is always nice to have that bit of variety for those who do not fancy eating meat. This should be a big factor due to the fact that this is your wedding and you must be happy, think about what sorts of foods you enjoy and write down a list of these; this way the caterer can create a menu based on your own variety of tastes. You may want to take on a theme for the food at your wedding, such as Chinese or Italian, if you wish to do this then it might be an idea to go with a specialist caterer who focuses on that style of food. Another thing to consider is whether you would prefer a buffet or sit down meal; this is something that your caterer will need to know in order to provide you with a quote and a sample menu. 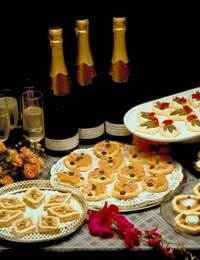 Most caterers will write up a sample menu for you to get an idea of what they can offer you with no obligation. Take a look at menus and quotes from different caterers and taken into account whether what they are offering fits with your needs. You need to take a look at price for your number of guests, how closely the caterer has followed your brief and how much the food appeals to you. You can also discuss with your caterer some of the items on the menu if you wish to change or revise them. Many good caterers will offer you small samples of the food they would normally produce for a wedding or event, based on the preferences you have expressed. There is also no better way to establish the quality of someone's food than a word of mouth referral. So ask friends and family who they would recommend and always get references from caterers you've never used before. Just looking at the menu may not be enough to sway your decision. Take a look at the price and see if it fits in with your budget, also by now you will have spoken with the caterer. You will be able to tell from your interaction how well you might get along with the different catering companies, if you get along well with one company they you are going to feel a lot more comfortable on your wedding day. The trick is to write down everything you want and relay this to your caterer with your budget attached so they can create something that fits in perfectly with your needs, you will always be welcome to change and refine things as you go through the planning process.